By Kimberly Rowe : For years and years, the 10th Standard Board Examination pattern was followed by all boards. However, since last year (2010-2011), the CBSE (Central Board Of Secondary Examination) brought the CCE (Continuous Comprehensive Evaluation) pattern to the forefront. This included not only the academic performance of a student but also, the all round development. Subjects such as Art and Craft, Dance, Music, Value Education, Gardening, First Aid, Sports, etc. were given as much importance as the general subjects of English, Hindi, General Science, Mathematics and Social Science. A strict check was also kept on student’s behaviours and attitudes. The CCE pattern also encouraged students to appear for the School Examinations instead of the Board Examinations (Year 2011-2012 onward it has been made compulsory). This was done to minimize the amount of stress and anxiety which builds up during the examinations for both children and parents. It also involved the nine-point grading system unlike the usual percentile marks. Unfortunately, the grading system created havoc for students who wanted to change boards. On the other hand, it spread smiles for those students who had already secured a seat in their own school’s junior college. Another student, Master Bharath L. batch year (2010-2011) said he preferred giving the Board Examinations as there was a longer time period to prepare and a lot more seriousness involved. Yet, he couldn’t help but admit that not only was the burden less through the CCE program but, he also gained a lot of confidence. 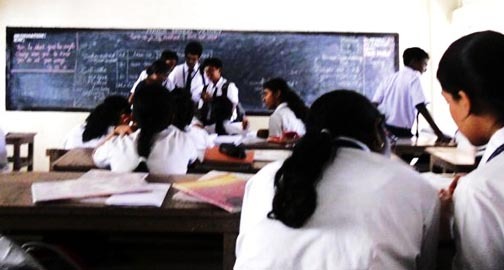 Although most teachers interviewed agreed that, the CCE way is a boon to education as there is no other pattern which involves academics, co-curricular activities and personality development of students all on the same ground; they didn’t feel that the nine-point grading system was ideal. When questioned further they said the percentile marks would be better as that is when students know where they actually stand in the competition. All said and done, i feel the CCE system introduced by CBSE is a better way of education, keeping in mind all extra-curricular activities. This pattern could however, soften the students and hamper them when they actually step out into the competitive world.